Carabao Cup: Get 25/1 Man City to beat Bristol City at Ladbrokes! Manchester City return in EFL Cup as they face Bristol City at home in the semifinal 1st leg match. Of course, the Citizens are odds on favourites at 3/25! Wanna back City to win at a bigger price? 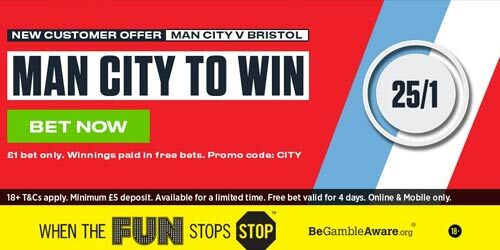 Join Ladbrokes and get 25/1 Man City to beat Bristol City! Promo code: CITY. After an underwhelming goalless draw at Crystal Palace, Man City returned to winning ways by beating Watford 3-1 in the Premier League and Burnley 4-1 in FA Cup. The Citizens are enjoying a 26 game domestic unbeaten and a 14-match winning streak in front of the home crowd. You can't miss this exclusive offer - back 25/1 Man City to beat Bristol City via this page! Join Ladbrokes via our special links and claim 25/1 for Man City to beat Bristol City! 3) Place a single bet of up to €/£1 on Man City to beat Bristol City in the 'Match Winner' market before the kick off. 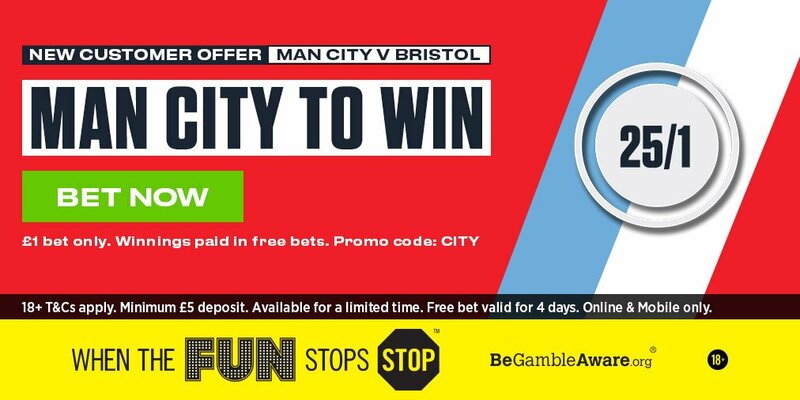 Offer available to new Ladbrokes Online & Mobile customers: Simply register today using promo code ‘CITY’, deposit a minimum of £/€5, and place your first bet as a single bet of £/€1 on Man City to win against Bristol (25/1). This offer is available from 08:00 Monday 08/01/18 until kick off (19:45) on Tuesday 09/01/18. "Carabao Cup: Get 25/1 Man City to beat Bristol City at Ladbrokes!"